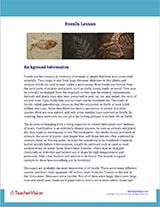 Use the slideshow, teacher resources, and student worksheets in this geology mini-lesson to give students a general overview of fossils and the past. This mini-lesson can be taught as part of 1 or 2 45-minute class periods. The activities and exercises can be completed in class or given as take-home assignments. The lesson content is accessible and approachable for both science teachers and generalists, and includes background material for brush-up or pre-lecture preparation. 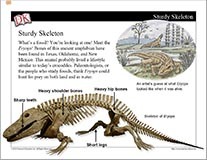 Use this mini-lesson to introduce students to types of fossils and how they are formed. Remind them that our knowledge of the past continues to grow and change as new data is discovered. Stunning real-life photographs of the spectacular remains of ancient lives offer a unique "eyewitness" view of what fossils are, how they were formed, and how they lived millions of years ago.